We pride ourselves on utilizing couture French seams on many of our specialty pieces. Unlike a standard seam, a French seam involves sewing the wrong sides together to achieve a double seam. As pictured to the right. While this technique is more complex and requires more time and effort, french seams allow us to conceal raw, unfinished fabric edges within the seam. This creates a clean and perfected finish for a truly elegant look. Hiding raw edges and using a double seam is a great technique for delicate fabrics, ensures less fraying and allows the garment to live a longer life. 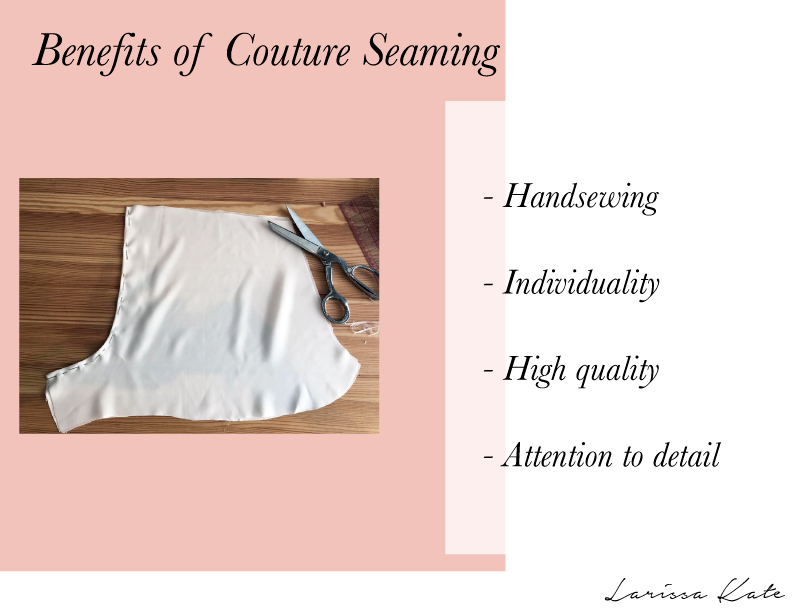 Most often, you will find French seams used on lightweight fabrics, as well as high-end quality clothing.